It’s a hot summer day and, suddenly, you’re craving a popsicle. This normally means one of two things: you a) must run to the store to purchase a ready-made pop that’s most likely full of refined sugars/other junk, or b) you make your own, yet must exert all patience within your begin to wait the hour or two they will take to freeze. Enter ZOKU Quick Popsicle Maker, the seven minute popsicle-making wonder. This machine is a summer game-changer. It really does freeze liquids in seven minutes to create beautiful, creative, colourful, mouthwatering pops. I was lucky to have discovered them through my SPUD ambassadorship – and since receiving the device, I’ve been making pops on repeat (see them in my Instagram feed here). Because I love them so much, SPUD has given me two ZOKU Quick Pop Makers to giveaway, each paired with a $50 gift card to their online grocery store so you can stock up on ingredients (and maybe some Juice Box cold pressed juices?) for your popsicle-making. …there will be two winners. Each will receive a pop maker and a gift card. Start by simply liking @spuddelivers on Instagram here (hopefully you enjoy their feed — it’s filled with beautiful local ingredients and healthy meal ideas). 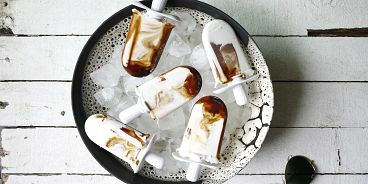 In the comments of my Instagram post here (mmm, coconut espresso pops), tag three friends who love popsicles (and then they can enter too!). There will be two winners! Contest ends Friday, August 14th at 10am. I’ll announce the winner soon after. Good luck! UPDATE: Congrats to @idreamofchairs and @erockspellmaster who are our two winners!! Please email me (erin at itstodiefor dot ca) to claim your prizes. And thanks to all who entered!!! Please note, this giveaway contest is valid to anyone living in SPUD’s Vancouver and Lower Mainland delivery area.